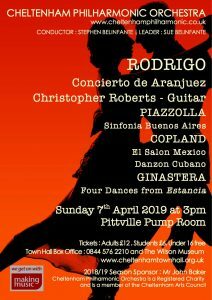 Tickets are now on sale for our Spring Concert – a journey through Spain and Latin America. You can buy your tickets on the Cheltenham Town Hall website, by phoning 08445762210 or in person at The Wilson Museum. Get your tickets early – our last concert was a sell out!